As it approaches a year old, the Mi Band 2 is still an attractive proposition – on paper at least. With a screen to view the time and your activity throughout the day and heart rate monitor, you won't find a similar band at this price. When I wore the Mi Band alongside the Casio Smart Outdoor, it got my active minutes pretty accurate over the course of a weekend of lots of stopping and starting island walks. But I noticed a couple of the timed sections in which I was definitely not moving. So, a mixed picture but essentially I never quite came to rely on the Mi Band 2, a similar story to the first devices. Whether the motivation of knowing you've had a 10,000+ steps day compared to a couple of very low step days is enough for you for a cheap device is another question. It also deals with estimated calories burned in a less useful way than say, the Alta which takes into account how many calories you burn even when not walking/running and gives you a running total. There's no GPS for accurate run tracking or any kind of extra features for runners so steer clear if you need this. The heart rate monitoring is a headline feature and has been improved but even when taking resting bpm, the readings do jump about within seconds. And the data is presented in a useful way in Mi Fit. I wouldn't, and essentially can't, use this to stay in specific heart rate zones out on a run as it's not continuous. On the plus side, it did take a reading every time I scrolled through to that option on the Band 2's own display and it's much quicker than firing up the app with the Mi Band Pulse. The other main feature, apart from tracking, is smartphone notifications, but this is pretty hit and miss. I tweaked the settings to get the Mi Band 2 to buzz when I had an incoming call or WhatsApp but essentially neither worked, which is actually worse than previous devices. This could be due to the Bluetooth connection being a bit patchy with my Samsung Galaxy or it could be a bug that needs to be fixed. One more thought on this - I might not have got such a good battery life if this had worked properly. At the launch, Xiaomi bigged up a new Mi Fit user interface but not a great deal has changed, at least so far. It's still more basic than the Fitbit and Jawbone apps. There's a dashboard showing the day's activity, last night's sleep, your most recent heart rate reading and when your last streak (of hitting targets) was. You can also manually track your weight in the app. From each of these you can access daily, weekly and monthly graphs, apart from heart rate which is still presented as a list of readings with little context - essentially useless. As I said, the Mi Band struggles to auto detect when you start running but the app is designed to break activities up into 'walk' or 'activity' in a timeline under the graphs. You can view the times, steps, minutes, distance and calories though I couldn't find a way to edit or group these as you get on other apps. Sharing stats within the app involved scanning the QR codes of your mates (no-one is going to do this) but there are also options to share your progress via social media - Line, Twitter (which takes you to a message), Facebook etc. In terms of motivation, there's no insights as such but Xiaomi does try to get you moving more and thinking about your sleep by displaying your percentage e.g. my steps today so far are ahead of 13% of people but my sleep last night (I got a super early night) was ahead of 90% of people. That's right. One last note on the app - it crashes constantly as you're using it (I was testing on Android). And syncing can sometimes take a second or two longer than I'd like. 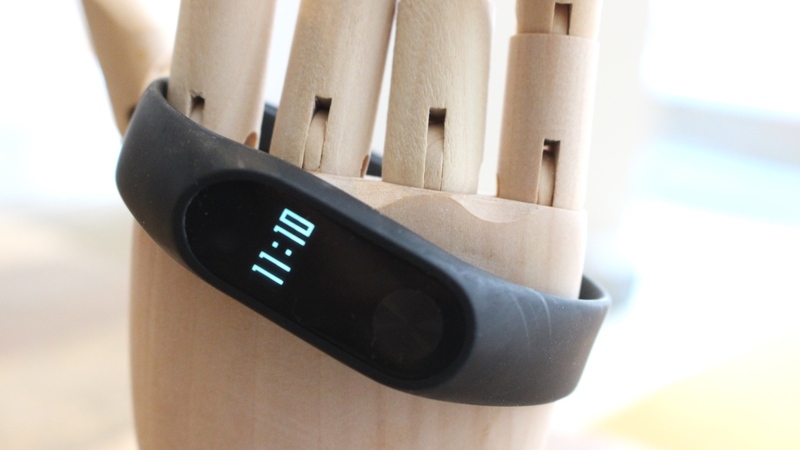 Here, Xiaomi trumps Fitbit but not, I should say, rival budget wearables. I've been using the Mi Band 2 for a week and a half now and its remaining battery, according to the Mi Fit app, is down to 24%. That suggests it wouldn't get to the claimed 20 days (more like 12 - 14) the way I've been using it but this will differ from person to person. Still, for a device with a display that's fairly impressive. Essentially if you charge it once every week, you should never run out of juice. It's not quite as no fuss as cheap trackers like the Withings Go, though - that has an E Ink screen to display the time and your progress and lasts eight months on a coin cell battery. The budget Misfit Flash Link, again, in theory lasts six months but if not, just swap out the battery. There’s a reason we’ve mentioned quite a few other trackers in this review. Yes, the Mi Band 2 is still cheap enough for it to be a punt and the screen and battery life make it more useful. But while this is a decent device for those looking to dip their toe into the world of fitness tracking, it’s worth looking at similarly priced, or slightly more expensive Fitbits, Misfits, or Withings trackers which might sound less snazzy on paper but actually offer a better overall experience.